So where do we begin to express our thanks for our Second Bordeaux Wine Experience? The pleasure never gets less and your hospitality, company and knowledge, is second to none. 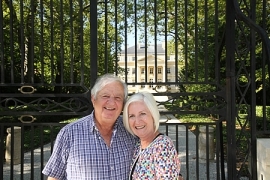 There have been many highlights including the dinners, meeting the chateau owners, the chateau accesses and Ronald your wonderful stories and Margaret your culinary expertise in enlisting our help in the kitchen. All très bon. Our best wishes for future tours and your future in wonderful Bordeaux.